One of the most enjoyable but also important parts of my role working for Compassion in World Farming is meeting and speaking to people from all walks of life and from all parts of the world. 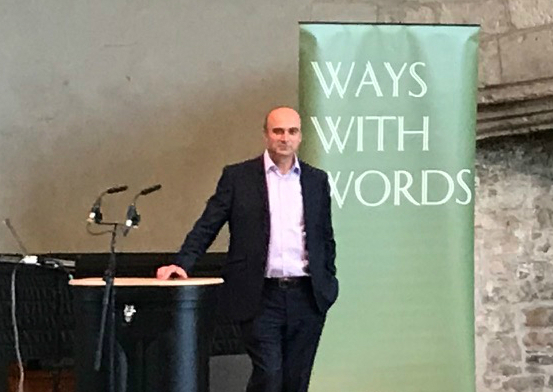 The other weekend I had the huge pleasure of attending the Ways with Words Literary Festival at Dartington Hall in the beautiful Devon countryside. It was one of those very hot weekends, England had just beaten Sweden 2:0 in the football (a game I could hardly hear on my dodgy car radio driving down to Totnes) and standing in the stunning medieval hall built in the late 1300’s, it seemed a world away from my day job. 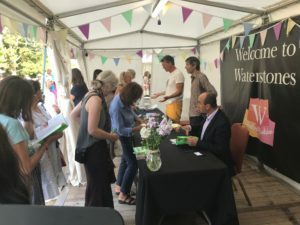 Ways with Words, as the festival is known, proved to be one of the most friendly I have ever visited. A small but lovely festival team helps administer the event for the many visitors and speakers. That weekend, I was lucky to meet some of the nicest people possible. Despite the relaxed surroundings, it didn’t take long to start chatting with fellow guests and visitors about why factory farming is the greatest abuse of animals on our planet and causing wildlife extinction and environmental damage. I was there to speak about my new paperback, Dead Zone; Where the Wild Things Were and also had the honour of participating in the Great Debate on Food Security and how we find a balance to feed the world. I shared a panel with Guy Watson, farmer and founder of Riverford, an organic farm and UK-wide organic vegetable box delivery company (Guy arrived on his bike after a swim in the Dart, I was so envious) together with Natalie Bennett, politician and journalist who led the Green Party of England and Wales from 2012 to 2016 plus Martin Owen, our excellent chairman. 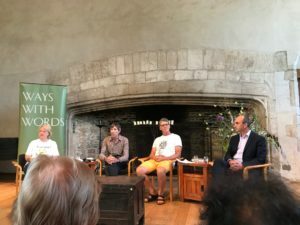 Both events took place in the magnificent great hall to sell-out audiences despite the heat and with programmes fanning faces, there were insightful questions from the audience in abundance. The only thing that gave up the ghost was the projector which badly over heated. Questions on the day covered almost every topic from population growth to organic foods, from river and soil health to the growth of flexitarianism and from plastics pollution to the loss of our biodiversity. There was a healthy dose of Brexit of course and perhaps a source of particular satisfaction for me was the overwhelming support for animal welfare and an end to factory farming. What was no surprise, were the questions posed to the panel from the floor about the use of CO2 gas on pigs in particular. The CO2 scarcity through the World Cup and heat wave led to a lot of publicity over poor supplies of carbonated drinks, beer and crumpets of all things but also some media mentioned potential welfare issues because of the use of CO2 in the slaughter of pigs and chickens. Some members of the audience felt there had been mixed messages on social media and in the press and asked the panel to give definitive details about the animal welfare issue hidden behind the headlines. It’s an issue I feel strongly about and I was grateful to the panel for allowing me to field the answer. It was, and is simple. Basically the use of the carbon dioxide gas for stunning pigs is a scandal. The pigs are lowered into a gas chamber containing CO2, causing the pigs to gasp for breath and hyperventilate, causing pain and panic amongst the terrified animals. Clear scientific evidence going as far back as 1996 has demonstrated that CO2 stunning for pigs causes severe welfare problems and a high degree of suffering. The study concluded that pigs show profound aversion to the gas which leads to “severe respiratory distress”. More recent evidence suggests that the pigs take 30-60 seconds or more to lose consciousness, a long time, especially when panicking and fighting for breath. Yet, 50% of all our pigs are killed this way and too little action has been taken to change the situation despite all the evidence. The outrage at this situation was palpable. My memory of the weekend was not tarnished at all by this closing question but rather I was buoyed by the huge support the answer received and the panel and I continued this discussion and many more, outside the hall in the book signing tent for a long time thereafter. A few guests asked me to supply more information and so for those interested, please find a blog (here) and a short video that I recorded before I left Dartington (below). As I left Totnes in the Sunday evening sunlight, my thoughts turned to my next trip to the New York and the United Nations a few days later. No peace for the wicked but I count myself very privileged to be working to make a difference for animals and I wouldn’t change it for the world.